Between 7 – 10% of a person’s weight is blood. Weight is a good guideline for blood volume in people of average build. This is why we set a minimum weight limit of 7st 12lbs (50 kg) because if more than 13% of blood volume is taken there is more risk of the donor feeling faint after donating. People who are very overweight may not be allowed to give blood for their own safety. Blood is a defence against infection and takes waste material to the kidneys. It carries oxygen and carbon dioxide to and from the tissues and the lungs. It gives food to the tissues and regulates the chemicals in the body and regulates the temperature of the body. 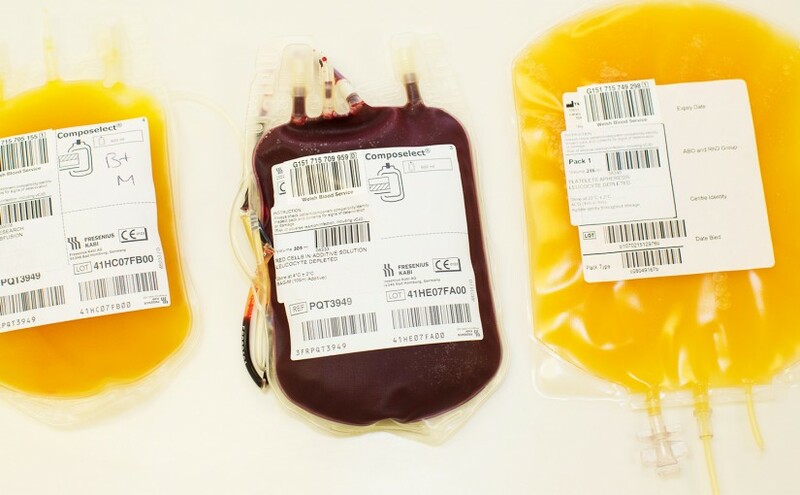 Each donation of ‘whole blood’ can be separated into red cells, platelets, plasma and white cells. Red cells can be stored for 35 days at 4°C.They are used to replace blood loss as a result of accidents, operations or disease. Platelets can be stored for only 7 days at 22°C. They help to prevent bleeding in people who have a low platelet count because of disease or as a result of treatment for illness such as cancer and leukaemia. Platelets are collected from whole blood donations and through a special machine method of collection called plateletpheresis. Plasma replaces fluid in burns patients. Fresh Frozen Plasma can be stored for 2 years at minus 40°C. It replaces missing clotting factors. Clotting factors such as Factor VIII are also removed from plasma to treat patients with haemophilia and to make immunisations such as anti-tetanus. White cells need to be used within 24 hours of collection. They are used in rare circumstances to help treat severe infection that will not respond to antibiotics. All but these special donations have the majority of white cells filtered out a process called ‘leucodepletion’.